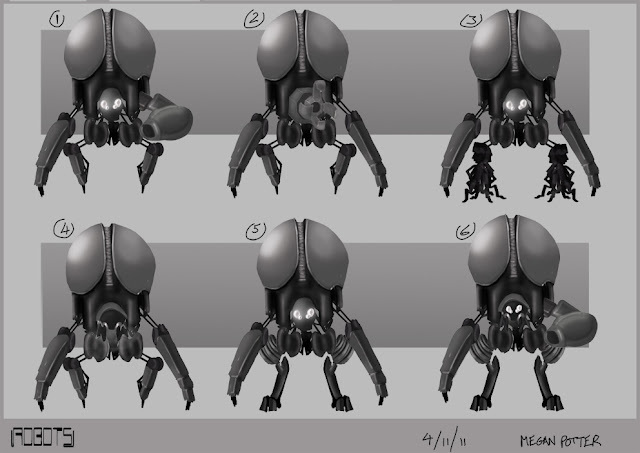 The bad robot was always the one in need of the most improvement, so to generate some ideas I took various parts from my other bad robot designs and tested them on this model. My concerns with the bad robot were that it lacked visible weapons and that it's legs made it look unstable so I tested a number of different limbs to see how to improve its appearance and make it look more like a bad robot. 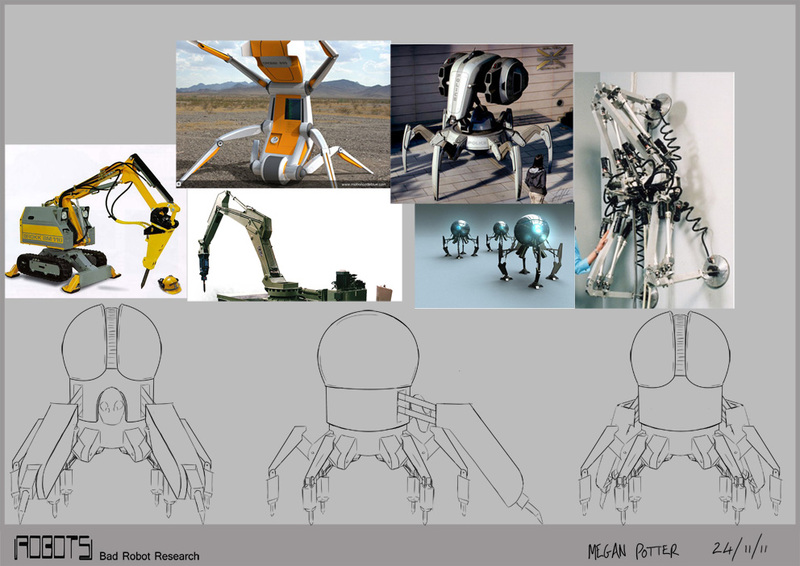 From my research I found that a lot of bad robots were designed with crab/ spider like legs; I thought this would be a great feature for my bad robot as it would make it look more threatening and it would strengthen its stance but I was reluctant to make the change from four limbs because I felt that it would ruin the continuity between my three robots. With this in mind I tried to work out how my robot stands and moves (I figured it would resemble the way a gorilla moves) but I found that with four limbs it would be very restricted in it's movements as it would have to have an arm down to support it at all times in order to keep it standing. So I looked further into the idea of giving my bad robot more legs and found that it did indeed solve all of the issues with stance and movement that it had; and as for continuity, I decided I would solve this by giving my other two robots additional limbs as well which actually made a lot of sense when considering their functions. 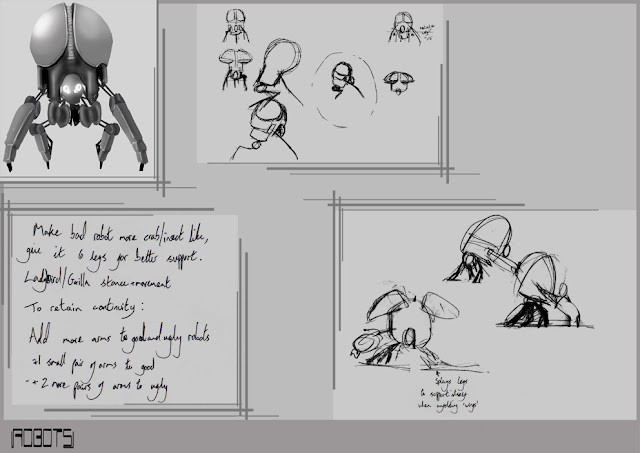 I did some research into robots with crab/ spider like legs, looking at real world examples so that I would know how to make my design more convincing; I liked the sharp appearance of the mechanical arms (bottom left images) and I had this look in mind when first designing this robot so I wanted to keep and refine this feature. This is my final design for my bad robot; if I were to continue making improvements I would like to refine the arms further but overall I am fairly happy with this deign.